The ANSYS event, dedicated to engineering simulation, will take place in Madrid on November 15. 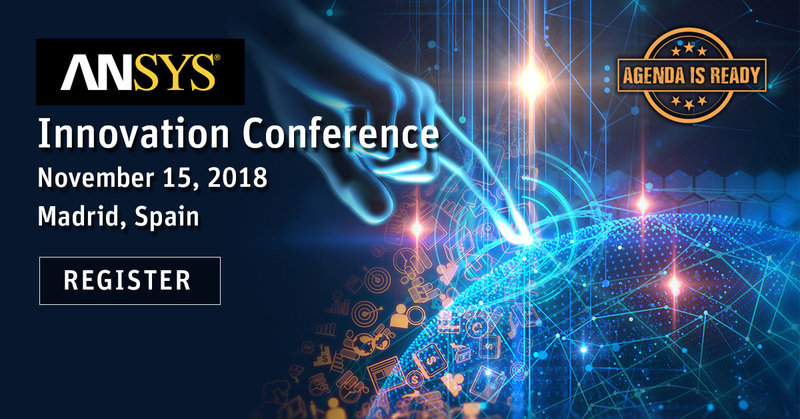 ANSYS has always been attentive to its customer’s needs and everything is ready for the 2018 edition of ANSYS Innovation Conference, the annual event that will take place on November 15 in Madrid. Located at the impressive Bernabéu Stadium, the Innovation Conference will give companies and its clients the opportunity to talk about the development of technology trends, the changing needs of the market, and the main challenges that companies face. Participants can find out all the latest about simulation solutions for metallic additive manufacturing; these procedures that make it possible to print complex components of light metal and to analyze the properties and the reactions of its microstructure. These new solutions can drastically reduce the cost of additive manufacturing, thanks to reduced waste and printing time. The company will also have the opportunity to present its most recent partnerships and acquisitions, such as that of OPTIS, a leader in optical simulation, thanks to which ANSYS can now offer a complete solution for simulation in the autonomous vehicle industry. The introduction of optical simulation together with the ANSYS multiphysics simulation, allows ANSYS to offer the widest set of tools possible to address all safety and reliability issues in autonomous vehicles, decrease the time to market, and reduce the need for billions of road tests. The news does not stop here. Participants will also have the opportunity to hear interesting speeches by ANSYS clients and technology partners covering different applications and topics such as: topological optimization, predictive maintenance, the use of Discovery Live for real-time simulation, as well as the use of Medini SCADE for software integrated in critical systems. The full agenda of the event and the registration form are available here.